I imagine walking into your kitchen at a quarter to six on a summer morning and having to put sun glasses on while you make the coffee. Susan Shortell doesn't have to imagine it. She's done it. 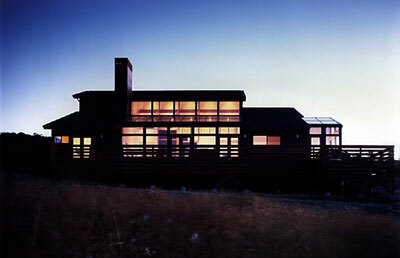 The mountain-ridge home near Sebastopol that Susan shares with husband Stephen Shortell is brighter inside on a foggy, cold January morning than most homes are in summer. A vampire would not get a good day's sleep here. "We wanted a home that is open to the environment, that brings nature in, that creates joy and has lots of light coming in," said Stephen Shortell recently. Essentially a sun room on the east side and a conventional wood-framed house on the west, the home fulfills other needs and desires as wellan art studio for Susan, a professional artist, and many built-in niches and shelves to show off her work; large, open living areas, and a big multi-level deckthe perfect place to enjoy their breath-taking view and the deer, wild boar, foxes and other wildlife which often emerge from the woods below. "We weren't looking for a real large home," Stephen Shortell said of the three-bedroom, 3,100-square-foot house. And while the exercise room is home to a stationary bicycle and a weight machine, there are plenty of long stretches of beautiful country road close by where Stephen, who is a occasional marathoner, can run. He runs about six miles a day, 30 miles a week and has competed in three marathons. "Is this our dream house?" Stephen asked himself. "It really is." The Shortells split their time between two homes, one in Evanston, ILL. (homebase for 14 years) and the new one near Sebastopol. "We decided we wanted to spend more time on the West Coast to be with our families," explained Stephen, a professor in Northwestern University's graduate school of health care management. "Susan has a sister in San Jose and another at Mammoth Lake.... Most of my family is in Southern California." They plan to live here full-time once Stephen retires. The Shortells found the property in 1990 and fell in love with the area, not only because of the view but because it is a short drive from ocean beaches Susan loves to walk. When they found the land, Stephen said, ideas began to form right away. Stephen, who was fascinated with architecture in his undergrad days, immediately went to work on plans for the Sebastopol home. "The Shortells wanted cedar. The more the better. And open spaces flowing from one area to the other," Kingwill said. 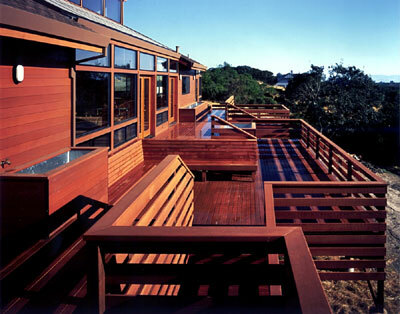 "There is a high use of wood in this house. More than normal. What is interesting to me is the blendcedar trim, beams and door trim of Douglas fir, and red oak flooring and cabinets." A panoramic view like that is possible because most of the glass in the house faces east. The exterior walls of the great room, kitchen, breakfast nook and master bedroom are comprised of about 64 feet of glass and only 12 feet of solid wall, Kingwill said. Because of the glass, you might think the house would become unbearably hot in the summer. That's not the case. The majority of vertical glass on the side of the house is dual-pane. The interior pane has a coating that reflects solar radiation away from the house. The section of sloping glass above the great room is even better at reducing solar gain, Kingwill explained. The slope acts like a mirror, diverting some heat gain, while mylar suspended between the two panes reflects sunlight away from the room. Because the mylar is suspended between the two panes, it creates two insulating air spaces. Even on a warm summer day, Kingwill said, the home's east side doesn't have time to build up heat because the cooler ambient outside temperature hasn't had time to add solar gain to the house. "You can stand by the windows and have the sun shine directly on you, and you won't be uncomfortable" able," Kingwill said. If the glass had been on the west side, the house would be 10 degrees warmer insideenough to cause discomfort. So that side vulnerable to afternoon heat buildupwas designed with windows only where needed. "The glass opens up to a great vista," Shortell said, "but when it's hot in the summer we don't feel it that much. The house isn't air conditioned, but it's been just fine. On some days when the thermometer read in the 80s, the house didn't feel like it." 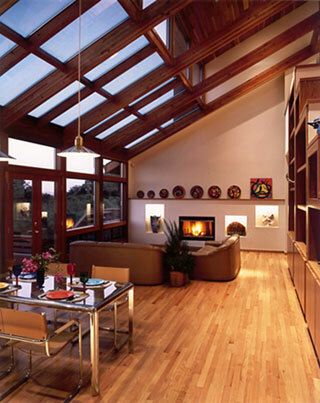 A good rule of thumb for houses, Kingwill said, is that only 20 percent of the walls surface area be glass. Although much of the east-facing side is glass, still no more than 22 percent of the total outside surface of the house is glass because there is so little glass elsewhere. Kingwill said. R values indicate the resistance to heat flow, the higher the better.